Workers at Lesotho’s Letšeng mine have discovered an absolute whopper of a diamond, rated at 910-carats. Roughly the size of two golf balls, the precious gem has an estimated value of $40 million. The rock, uncovered in the landlocked southern African country of Lesotho, is a 910-carat, D-color Type IIa diamond. This type of diamond makes up about 1 to 2 percent of all natural diamonds, containing no measurable impurities such as nitrogen atoms. Type IIa’s are typically colorless, and are practically transparent in ultraviolet light. At 910-carats, it weights 182 grams, or 6.42 ounces. The Letšeng mine in which the diamond was unearthed is owned by Gem Diamonds, a British-based global diamond mining business. The Letšeng mine is renowned for producing big, high quality diamonds. Back in 2015, Gem Diamonds sold a 357-carat rock for $19.3 million, and in 2006 it discovered the 603-carat Lesotho Promise. The company didn’t say how it would sell the diamond, or disclose its worth, but as Bloomberg Quint reports, the precious stone could be worth $40 million if it’s devoid of large internal defects. This announcement caps off an amazing week for the struggling company. Last week, Gem Diamonds announced the discovery of 117-carat and 110-carat stones. Stocks in the company jumped 18 percent in light of these finds. 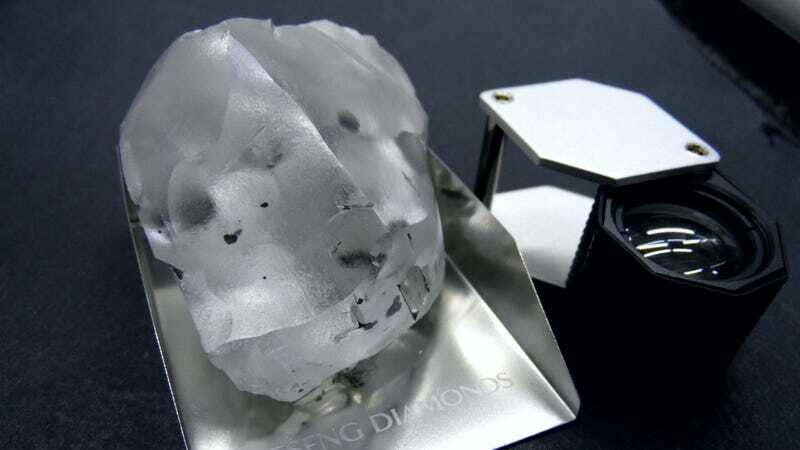 As noted, this is the fifth largest diamond ever discovered. The largest diamond, a 3,106-carat stone found in Pretoria, South Africa was cut into two stones and set in the Crown Jewels of Britain. The other big ones are the 1,109-carat Lucara diamond, the 995-carat Excelsior, and the 969-carat Sierra Leone.